Channel Islands National Park Superintendent Russell Galipeau is pleased to announce the premiere of a new park film Treasure in the Sea and visitor center exhibits. “We hope our new film and exhibits will help connect people to their national park and inspire them to protect the park’s precious resources,” said Superintendent Galipeau. The National Park Service and Aperture Films, Ltd., a southern California film company, produced the new high-definition film that contains stunning IMAX-quality aerials and 3-D animations. Filming took place over a two-year period covering all four seasons on the ground, in the air, and underwater. The filming process was comprehensive and challenging. Over 50 hours of footage was compiled, including aerial footage filmed using a high-end gyroscopic aerial camera system mounted to the nose of a helicopter. With limited transportation available on the islands, crews had to hand-carry heavy gear such as cameras, cranes, batteries, and dollies to each shooting location on the remote islands. Watch this wonderful new film at the Channel Islands Visitors Center or on the Channel Islands National Park website. 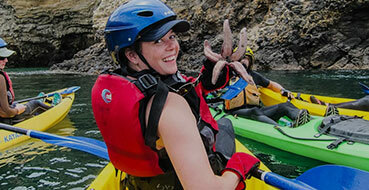 See what makes Channel Islands kayaking and camping such an amazing experience. The film’s producer and director is Aperture Films President Joshua Colover. Colover graduated from the Tisch School of the Arts at New York University where he received the Martin Scorsese Scholarship and the Wasserman Award for his directing efforts. In 2003, Colover produced the feature documentary Farther Than the Eye Can See, an epic and inspirational story of a blind man’s quest to climb Mt. Everest. It received Emmy nominations for Best Documentary and Best Cinematography and has been recognized as one of the 20 best adventure films ever produced.